Entries cover more than 2,000 content-area vocabulary items, as well as general academic vocabulary and full coverage of everyday words and phrases. The CD-ROM lets students search for vocabulary by subject area, includes audio of all entry words, offers word family and frequency information, and has a thesaurus and instant lookup feature. Easy-to-understand definitions make the meanings clear. Subject labels make it easy to find content-area vocabulary. 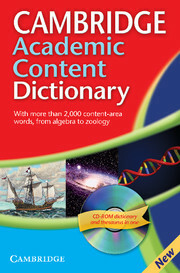 General academic vocabulary labels show which words are the building blocks of academic writing. Full-sentence examples show how English is really used. Usage notes help students avoid common mistakes. 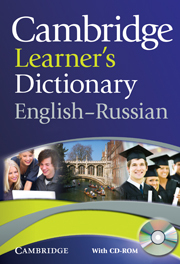 The first edition of the semi-bilingual English-Russian version of the Cambridge Learner's Dictionary with CD-ROM.